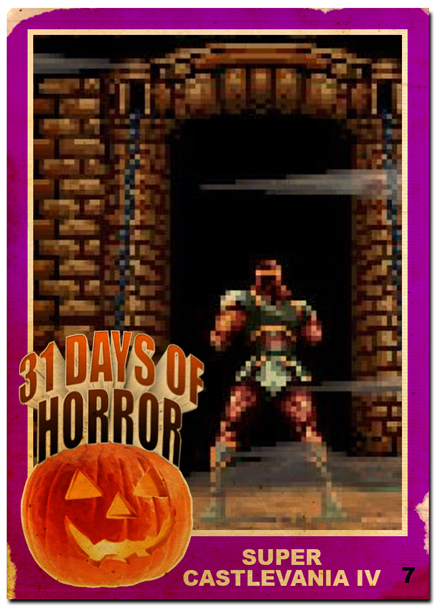 Originally released in Japan on Halloween in 1991, as Akumajō Dorakyura (Devil’s Castle Dracula) Super Castlevania IV was the franchises first foray into the 16-bit era. The game is more or less a re-imagining of the original Castlevania but with the obvious graphical and audio upgrades the more powerful SNES provided. Set in 1691 Transylvania, Super Castlevania IV follows the exploits of SImon Belmont and his trusty whip, Vampire Killer, as he attempts to fulfill his family legacy and destroy Dracula once and for all. To do so, he must fight his way through eleven levels of the vampire lord’s minions and navigate treacherous cemeteries, caves and castles. Often listed as one of the most popular entries in the Castlevania franchise, the game still has a devoted following to this day amongst retro gamers who cite its excellent graphics and sound, imaginative enemies and levels and tight, responsive controls. If you still have a functioning SNES you really need to track this cart down. The cart by itself will run you $25-$35 on eBay and a complete in box version can go for upwards of $60 – $100. If you don’t already have it or don’t want to pay that kind of money, it is available on Nintendo’s Virtual Console for 800 Wii points.